It is not often that I blog almost daily, but I don't think I will have much time after today and I will probably forget what has happened by next week. A quick update of the Gas Meter Gang... Lazarus joined his brothers and sisters and was accepted straight away. The egg in the incubator eventually had to be assisted from its shell. David and our eldest granddaughter carefully peeled it out, (hence its name... Peeler!) and we left it in the incubator for a day to get it's strength up. Tonight I have slipped it under mum and fingers crossed she will not notice another.. final count .. 10.. not bad eh? We have been discouraging the other hens from going broody as we have enough birds for our needs. One other hen however, has manged to escape my egg stealing tactics and should be due to have her hatching this Friday. She pushed 3 eggs from her nest today and I think she has five left. It is difficult to tell. We received two new born ewe lambs on monday evening, bringing our cade lamb total to five, which is just right for our paddock when they are bigger. The new lambs Bubba and Betty are very small, but seem tough little things. Betty has one eye closed, so I am bathing it as I believe it might just be stuck with a bit of weepy-eye stuff (technical eh?) I am being careful and taking my time with clean cloths and warm boiled water and should know by tomorrow if she will get her vision back. They are all electronically tagged as is the law from this year for ALL sheep and lambs. I have always kept my movements in a movement book. Yesterday I took the plunge and went online, which I must admit has made the movements so much easier, it wasn't too clear really at first and I wondered how some farmers, who are not too comfortable with computers are managing. I realise that sounds patronising, but it is not meant to be. MY daughters and granddaughters will be here tomorrow teatime. We are having a sewing evening. Material has been bought to go with the cheap patterns we bought on the internet and we hope to make a good start on our summer dresses. I have two meetings for the Civic Society this week, which I could well do without as we are off en-famile to Harry Potter World on Saturday and sundry people will be looking after the smallholding. I am trying to make it as easy as possible and it feels like I am planning a battle campaign. Usually our eldest daughter or granddaughter take over, but they will be with us, so I will need to write copious notes to help our sitters. I managed to do a little seeding in the greenhouse today, but still have much to do. I'll get there I am sure. All for now, must wash off the smell of sundry animals as I am off to fetch David from the pub. He is at his Quiz night. This has been a very "animally" week for me hasn't it? I went out to have a look after I posted and slap bang in the middle of a path sat mother hen. Clearly, the chicks had run out of the nest and she had followed them and was sitting on them to keep them safe. Several feet away at the gas meter site were three cold eggs and a pile of egg shells. I went over to the pile and found that the eggs were cold., though one was cheeping..what to do? I fetched a big cardboard box from the garage, put straw thickly on the bottom and ran back to Mother Hen. Picking a hen up that has chicks under her is not a job for the faint hearted. Sustaining several vicious pecks to my hands and arms I put her in the box, she immediately jumped out of course, but I soldiered on. I picked up the five chicks that were on the path to place them in the box and she attacked me again and another chick fell out from under her wing. When they were all placed in the box she finally got the idea and jumped in with them. I then placed the remaining eggs under her and after several more vicious pecks and some very un-ladylike language (from us both) she settled. I covered half the box with a cloth and left her. I then set about clearing up the egg shells and under the pile of empty shells was a cold dead chick. I was going to dispatch it to the bin with the shells but thought it might be worth a punt to revive it ( we have bought a chick "back from the dead" before ) So I tuned on our incubator to warm and fetched a hair dryer. while the incubator was warming I cuddled the chick in my jumper and from about a foot and a half away blew warm air onto it. After half an hour it started to move and began to cheep faintly, so I popped it into the incubator. I put a jam jar lid of water and one of chick crumbs in with it an I am sitting here fingers crossed. This interlude successfully got rid of my morning! I guessed it was worth risking introducing him back with its brothers and sisters. While one of us put fresh chick crumbs in front of the hen I snook Lazarus under her tail end. Result! in he snuggled. After tea we carried the the box over to the ark and while David lifted up the hen (ooh the language!) and we placed the chicks in the run ..all 9 of them!! Mum soon followed them and settled down straight away. Two of the remaining eggs are clearly not viable and the hen has now kicked them out, but the third is still cheeping so we have put it in the incubator to see what happens. Once the run was assembled for the lambs they had their afternoon bottle. Here they are being fed by my granddaughters. And here are said granddaughters with their dogs. I think that is enough for this post. I'll read the comments from my last post now and reply to everyone. Hello from a sunny but chilly Derbyshire. A warm welcome to Annie, UnDomesticDiva (great name) and LilaCottageGoats and Bonjour to Frugal in France who have clicked the Follower button and Edith and Jean Schofield on Blog lovin. Lovely to see you here. Anyone who has kept hens knows the sound of a broody leaving the nest for "the daily poo". She squawks and runs around like a maniac, deposits the most enormous smelly poo, she might have a dust bath or drink and returns as soon as possible to her clutch. Last week we heard this sound in the front garden, identified the hen and watched her return to a clutch of eggs against the wall of the house next to the gas meter. This wall is about twelve feet from the main road and it is possible that everyone in the village but us knew she was there ! We had no idea how long she had been there, but the eggs looked pretty shiny (not freshly laid) We have had very little rain, but the nights have been cold, but she seemed pretty comfy. I placed a board against the wall to provide some sort of cover and ensured that I left food and water next to her. On Friday the Gas man called to read the meter. "It's outside" I said "I'll come with you". "No need" he said "I'll manage". I insisted and ensured that he was quiet and careful, as I realigned the wood so that he could open the box. he said that he had never encountered such a thing before and went away chuckling. This morning I took some water and food to her and knew straight away that she was not talking to me, but to chicks with the special hen-to-chick speak. I immediately changed her water bowl for a shallow bowl ( I think I have lost more chicks to drowning in water bowls than any other cause) and found some chick crumbs to add to the hen food. As hens sit for 21 days she must have been there for two weeks before we spotted her! So the first job for us today is to get a small ark ready for her and the chicks, so that they can be kept safe. Our cat Dixie doesn't touch chicks, but she isn't the only cat in the village! Welcome to Myshabbychicvintagefrugallife on the follower bar and Joanne and Kate Greenhalgh on Blog Lovin. It's been a while since my last post but I really have been busy. Spring has started to spring here on our Derbyshire Smallholding. - The pond in the orchard (posh word for an enclosure with fruit tress in it that also serves as the chicken run) is full of frog spawn, hens have started to go broody all over the place, three little piggies are ensconced in the barn and have been joined by three lambs - so it's bottle time again! Sucker for punishment aren't I ?- I was suppose to be taking it easier this year. The pigs are a cross between a Large English White and an Oxfordshire Sand and Black (or is it sandy-black?) anyway these boys look just like large whites as their sisters seem to have inherited the colours of the Oxford. They look exactly like each other so it is difficult to say who is who. I have noticed, however, that they have different voices, so I guess I will be able to tell soon as I get usd to them, plus the numbers in their ears help! We picked up the three lambs yesterday. I love looking around other holdings and this one was deep into a wood in the middle of nowhere. The singleton is three days old and called biscuit, the twins are two days old and are called Baaaabarara and Biffy (boy) yet again, the grandchildren named them and obviously it is the letter "B" this year for lambs. 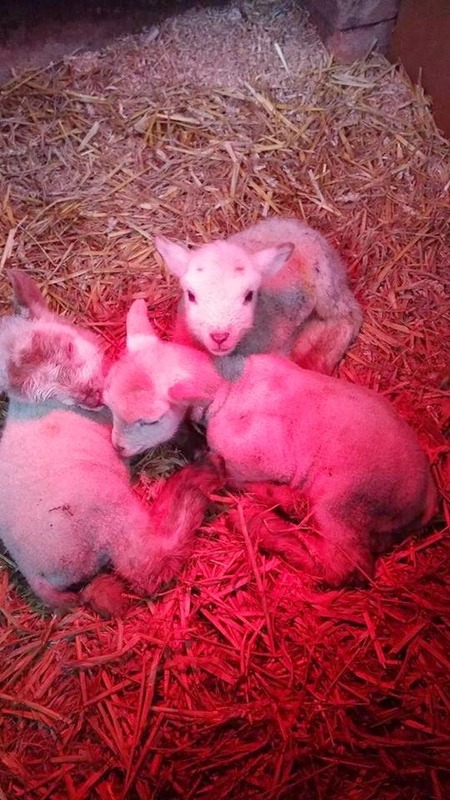 Here they are, snug as bugs in rugs, under a heat lamp just for a couple of nights to get them off to a good start. They are feeding from their bottles really well and we are hopeful for them. It is likely that we will get two more yet if they are available. I seem to be spending a lot of my time mucking out and moving things around this week. I'm hoping to get time to do some Civic Society work tomorrow as it is the AGM next week and there is much to do. As always, at this time of year I am happy to see the back of Mother's Day, which I dislike more and more. When we were young we used to be given a little card at Sunday School, this we gave to our mothers, who would use it to mark their place in their bible or hymn book. We might also give them a little posy of primroses or violets if we could find them, It was called Mothering Sunday then and was for young children and their mummies, not for grown ups to spend large amounts of money on goodness knows what on their mothers. I don't need a card or anything else from my children, they came for tea on Sunday, but then they come for tea EVERY Sunday. I'm not doing too well with my seeds this year. I keep looking at blogs where there are rows and rows of seedlings, looking strong and almost ready for the ground. I have a few up but most are still in the packet! All for now, off to wash the smell of pig away. PS Does anyone know why I suddenly have a lot of views from Russia!? Welcome to Alison Murphy on Blog lovin. I seem to have lost someone from the follower bar.. is it something I said?! I have been really busy this last week, hence my tardiness with posts. I went shopping this morning, stocking up on baking stuff as I need to make a few cakes and cookies. We are expecting quite a few visitors this weekend and I like to offer a slice of cake with a cup of tea. On Tuesday afternoon we have a work party organised for "our stretch" of derelict canal and the volunteers will need some sustenance. Then on Wednesday evening we have a large meeting at our house so tea, coffee, home made wine and cake will be the order of the evening. I went to Lidl and found that their sugar was 49 pence a bag and butter was 89 pence a half pound, really good value. I already have a plentiful stock of flour and the hens are laying well. We went to see the pigs I mentioned last week and put our name on 3 boars. They are Large English White and Oxfordshire sandy and black cross (though there is little sign of the latter) By next weekend they will be ensconced. Pictures to follow soon. I promised our youngest granddaughter and my godson's daughter that they could name one each. So welcome Pickle and Gregory (I have no idea!) said Godson said that he wanted to name the last one as he hadn't named an animal in many years so Welcome Mr Grey ! I have finally found a farmer that may have cade lambs. There was a time when farmers almost paid you to take them away, but there seems to be a real shortage nowadays. I have told him that we will take 4 to 6 if he gets any. I already have a large sack of lamb milk replacer that was given to me by a friend to get us started. The greenhouse seeding is not going too well. The tomato seedlings seem to have stopped growing. Those that are left that is.. A blackbird was shut in, I have no idea how, and knocked off a couple of trays of tomato seedlings, most of which have snapped off. she also knocked over the onion seedlings and dug up some broad bean seeds. Goodness knows how long she was in there or indeed how. Here is a picture of the load of branches from the back of our godson's pick up truck.. He bartered these for a nucleus of bees. Good swap methinks. Today and yesterday David has been cutting the branches into lengths for the fire, and grading them for thickness. When cut we have put them into tonne backs to keep them together and get an idea of how much wood we have from this load. So far we have two tonne bags full of one foot lengths and still cutting, grading them for size. These logs will be for next winters burning. 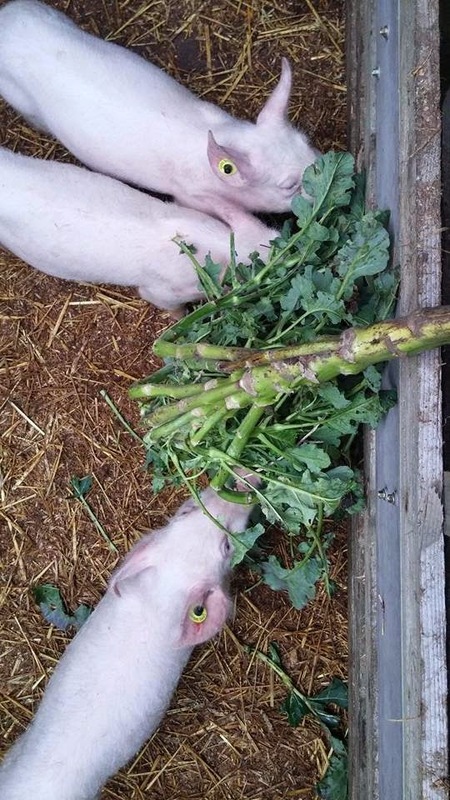 Reading SimpleSuffolkSmallholders blog about downsizing or reducing jobs I realise that we are probably doing more (pigs!) and really should be thinking of doing a little less. We do have regular monthly break though. If you call travelling to Cornwall for a weekends fishing a break! Talking of fishing , the first trip is set for the Easter weekend. Our youngest daughter will move in again while we are away. She hasn't actually said that she doesn't like pigs (or lambs or chickens or rabbits) but her eyes did go skyward when we said we were thinking of getting some. All for now, hope not to leave it too long before I next post.